LAOS: In central Laos dozens of loud explosions pockmark the sky as men dressed in female clothing wielding large wooden phalluses dance, while others lubricated by the local rice whiskey simply roll in the mud. Welcome to Laos’ famous rocket festival, a raucous celebration and merit-making ceremony in which huge homemade rockets are launched into the sky in a bid to encourage the gods to send much needed rain. “My rocket went very high,” said elated San Pommati, a 42-year-old farmer, after his projectile arced across the sky leaving a fluffy smoke trail above the village of Houa Xeing, some 30 kilometres north of Laos’ capital Vientiane. “It was beautiful, I am happy,” he said last Sunday (May 29). Throughout the day dozens of homemade rockets, many decked out in flowers, were strapped to a large wooden launch pad and sent towards the heavens, accompanied by cheers, dancing and much drinking. Practised across much of Laos and northeast Thailand, the Bun Bang Fai festival is an annual rite that celebrates the arrival of the monsoon, a magical moment that nourishes the fields after months of baking dry heat. The rockets and accompanying vaudeville dance acts are designed to prod the gods into sending thunderstorms. Laos and much of the Mekong region has been hit by some of the worst droughts in decades this year. 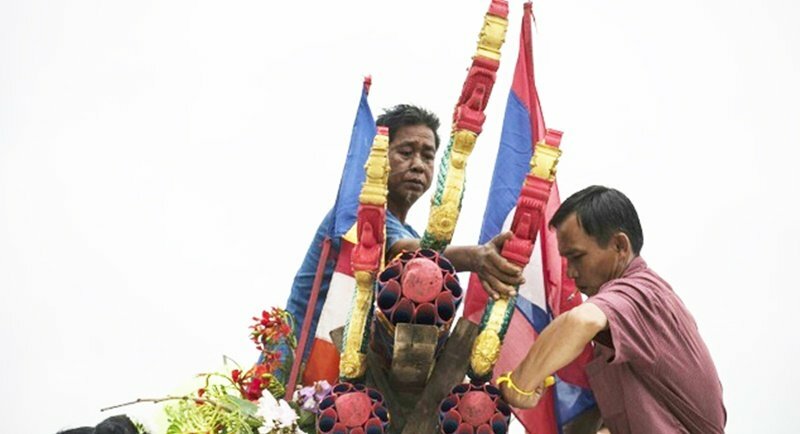 “It’s a tradition for us to ask the spirit to bless our works and our crops,” Somthet Surasont, a member of the local organising committee in Houa Xeing, said. Like Thailand, Laos’ Buddhism is infused with a blend of animist and pre-Buddhist traditions. The festival is fiercely competitive. Each group builds and finances their own rockets while judges assess them against a string of criteria, from how dramatically they take off and how far they fly to the aesthetic qualities of the smoke trails they leave behind. “We collected the money to build our own rocket,” said 18-year-old Sa Yoopakdi, a street vendor, who was entering the competition for the first time. “We like it because it’s both traditional and fun,” he added. Communist and landlocked Laos remains one of Asia’s poorest countries, with more than three quarters of the population still subsistence farmers. According to the World Bank, 23 per cent of Laos’ seven million inhabitants live below the poverty line. Many will be praying enough rain falls to alleviate the ongoing drought and produce a bountiful rice harvest.